Space is filled with many strange and wondrous things, some of which are currently not fully understood by modern science. Space is also filled with many mundane and simple things, some of which are also not fully understood by the people of Earth who are desperate to find something else out there. This is where alien sightings, UFOs and other associated conspiracy theories come in. The often grainy nature of space photography means it is not hard to find flying saucers, little green men and more in NASA pictures. Let’s take a look at some of them and try to figure out what they really are. When NASA’s Viking 1 was circling Mars in 1976 it sent back some extraordinary photos of the Red Planet’s surface. On of them in particular appeared to show an eerie face looking right back at the camera. The photo was a huge sensation, and NASA hoped it would inspire interest in its Mars missions. It certainly grabbed the public’s attention and it wasn’t long before people were talking about ancient alien structures, pyramids and ancestors on Mars. The face is merely a large mesa rock formation that doesn’t even particularly look much like a face. Admittedly the original image does resemble a face, but this is due to the low quality of the early camera. Its ‘eyes’ and ‘mouth’ are merely shadows, while the nostril is merely a black spot caused by limitations in transferring photos at the time (you can see hundreds of them spread throughout the photo). Subsequent missions to Mars made it a priority to photograph Cydonia. With every mission came improvements with camera technology as well as pictures which debunked the ‘alien face monument’ theory. One of the most recent photos shows quite clearly it is simply a geographic formation. Another well-known space conspiracy theory concerns a supposed alien satellite which is orbiting the polar regions of Earth and broadcasting a strange message. Some claim it has been there for 13,000 years and constitutes a welcome invitation from an advanced alien race. Despite this explanation, the claims these pictures are an ancient alien satellite persist. In reality, all the claims regarding the Black Knight have been categorically debunked. 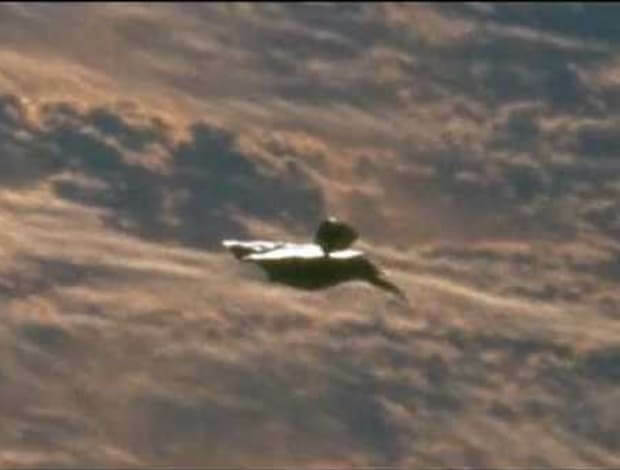 The interest surrounding the video was so great, NASA conducted an investigation into the object. After digitally improving the picture and conducting frame by frame analysis, they discovered the object had a “linear feature” attached to one side (above). Eventually, they deduced it was nothing more than the floodlight boom used for EVA missions. When NASA’s Spirit Rover was trundling around Mars looking for signs of water, it seemed to have found something much more spectacular – a Martian woman. The image, sent back from Mars, appears to show a figure just chilling out on a rock and seemingly unaware of the massive NASA rover only a few meters away. Of course, many saw this as proof of life on Mars. Talk about a tempest in a teacup! The rock on Mars is actually just a few inches high and a few yards from the camera. A few million years of Martian winds sculpted it into an odd shape, which happens to look like, well, a Bigfoot! It’s just our natural tendency to see familiar shapes in random objects. Plait is referring to a well-known psychological phenomenon known as pareidolia, which causes humans to often find familiar things (such as faces and bodies) in random shapes. This woman isn’t the only example of pareidolia on Mars – in fact they are dozens of them, including rats, dragon skulls and alien skulls. A Youtube video claiming to feature dozens of leaked images from NASA included this curious picture which it says shows buildings on the surface of the moon. Of course, there’s a lot in this picture which doesn’t make sense, like for example, why does the moon appears to have foliage and a pond nearby. But, more importantly, many people have seen that building before – and not on the moon. The building is in fact a photoshopped image of Iran’s Ardeshir Palace, one of the oldest and best known Sassanid palaces. It’s notable domes as well as its nearby road and domes are all clearly visible in the picture above.